Daman Products Company is a designer and manufacturer of hydraulic valve manifolds. 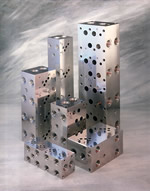 The company specializes in standard catalog products and custom engineered products developed from customer schematics. Maximum product pressure ratings are 3,000 psi (aluminum) and 5,000 psi (ductile iron). Daman is located in Mishawaka, Indiana and was founded in 1976.